Italy travel guide: where to go, suggestions and travel tips. Places and cities still not hit by mass tourism. This website has the purpose of presenting the authors' trips & travel in Italy, through their pictures taken during weekend excursions into cities and naturalistic areas of this country, and works as a completation of my main travel website, where trips from all over the world are illustrated. 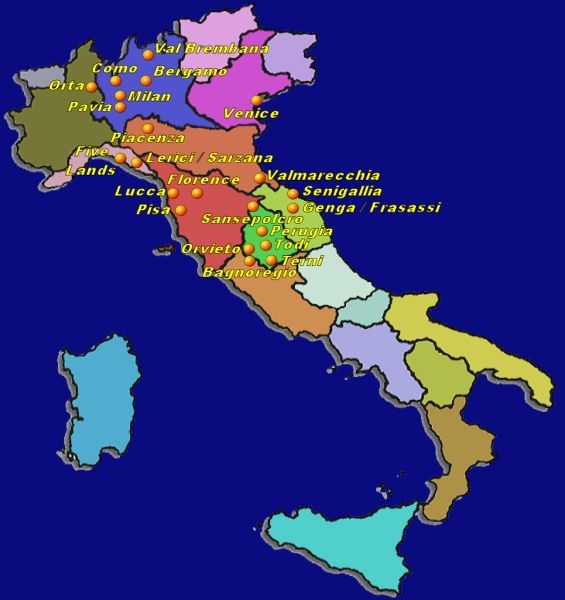 Currently, the following italian cities are present: Orta San Giulio and Orta Lake (Piemonte), Como, Milan, Vigevano, Pavia, Bergamo (Lombardia), medieval castles around Piacenza and Rimini (Emilia Romagna), Ligura and the Five Lands, Venice (Veneto), Lucca, Florence, Pisa, Sansepolcro (Tuscany), Senigallia, Genga, Frasassi caves, Pesaro Urbino (Marche), Todi (Perugia, Umbria), Marmore falls, Piediluco Lake, Orvieto (Terni, Umbria), Civita di Bagnoregio (Viterbo, Italy). New destinations will be added in future. Italy is easily one of the best destinations in Europe (and perhaps among all the world) if you love history, museums, ancient architecture, arts and food. Shopping is also excellent and you will find top-quality fashion items for which the country is famous, in many shops and outlets. The countryside is also fantastic and several regions, like Tuscany, Marche, Umbria and Apulia, will offer opportunities to stay in five-star farms, from where you may take exciting day tours to medieval towns, hike among beautiful landscapes and taste excellent locally produced food. Beside the classical tourist attractions in Italy, the country is also famous for excellent beaches, for example around Venice, Rimini, Riccione, in Tuscany, Apulia, Sardinia and in Sicily, as well as for ski resorts all around the Alps. WHAT IS THE BEST SEASON TO GO TO ITALY? Best time for cities, museums and monuments (but also for nature and landscapes): if you would like to hike among cities like Florence, Venice, Rome, Naples or everywhere there are monumets and museums, the beast season to visit Italy is between April and May and between September and October. During these shoulder seasons, the temperature is usually not too hot and not cold, with less rain compared to wintertime. Such weather is ideal for all day sightseeing among monuments and picturesque corners of the cities, but also to explore national parks or beautiful landscapes, like Cinque Terre or Amalfi Coast. Best time for beach life: the best time to visit Italy if you would like to enjoy sun on a beach and swim, it is usually from late May to late September (or early May to mid October if you will go to southern Italy or to Sicily or Sardinia). You should of course keep in mind that earlier in the season the water will be colder, while later in the season the air temperature may begin to drop a little bit. Best time to visit the countryside (and eat local specialities): from late spring to early fall, is the ideal time to visit farms or to spend the full holiday in the countryside (I would anyway avoid July and August, as it may be too hot). The specialties available for tasting will be different from month to month, as they are produced locally only using products not coming from far away. HOW TO GET TO ITALY? The main gatways to Italy getting intercontinental flights are Rome Fiumicino, Milan Malpensa and Venice Tessera. Seasonally, also Pisa, Naples and Catania may get some intercontinental flight from the Middle East or from the USA. From the main airports, you will find lot of domestic flights going just everywhere (to Florence, Bari, Brindisi, Palermo, Bologna) although for short distances (for example from Milan to Genoa or Milan to Florence), the only way to move is by fast train. Alternatively, you may arrive in any larger European hub like Paris, Frankfurt, London or Madrid and from there you will find direct flights to most cities in Italy. HOW TO GET FROM AIRPORT TO HOTEL IN ITALY? A beautiful hike on mountain's mule-tracks and trails, from Cornello dei Tasso, home of the famous writer Torquato Tasso, to Oneta, a charming small town where the tradition claims it as the Arlecchino's birth place. Excursion in the city of Como in northern Italy, visitng the downtown, the lake, the town of Brunate (reached by cable car) and several trails on the mountains around the city, where there are spectacular sights over the beautiful landscape all around. Weekend in northen Italy to the picturesque town of Orta San Giulio in Piemonte (Piedmont) over the lake of Orta. Pictures from northen Italy and lake regions. Trip to Bergamo, hiking between antique palaces and narrow streets, visiting the most important monuments. The italian metropolis, capital of the affairs and of the fashion, offers any type of distraction, but also lots of culture that can be found between the many ancient palaces, the churches, the cathedral (Duomo di Milano), the countless museums and art galleries. Vigevano is known to have one of the most beautiful central square in Italy, surrounded by magnificent arcades, a cathedral with its typical curved face and a beautiful castle in Renaissance style. Pavia is built along the Ticino river and has one of the oldest university in Italy. Excursion in romantic Venice, a city unique in the world, where is a real pleasure to hike between the water channels and in the narrow lanes without any car, but only small boats and gondola. Visit to San Marco square and other monuments. Day trip to the beautiful medieval towns around Piacenza, with their castles full of history, between green hills and valleys in northen Italy. Trip to the Five Lands (Cinque Terre) in Italy, with excursions to Monterosso, Vernazza, Corniglia, Manarola and Riomaggiore. Hike on the Love Trail between Manarola and Riomaggiore (via dell'Amore). Trekking on the trails connecting the Five Lands and between the vineyards. Trip to Lerici, Montemarcello and Sarzana in the italian region of Liguria, near the border line with Tuscany. This area is beautiful for charming small towns, nice sea and beaches, rich history. A picturesque city in Tuscany, enclosed by 4,5km of ancient walls and lush gardens, allowing the access to the downtown having many narrow streets, old stone houses and lots of churches built with white marble. Short trip in Florence to discover the many beautiful monuments, like the Giotto bell tower, that this city has to offer. An hike along the Arno river to Ponte Vecchio, as well as additional sightseeing, is also included. In Pisa there is the famous Miracle Square (piazza dei miracoli), where the most beautiful monuments and the Pisa Tower (Torre di Pisa) are present. We visit also the Santa Maria della Spina church, having wonderful walls made with and decorated by white and pink marble. Trips and excursions by car during a weekend near Rimini and Pesaro Urbino, between several ancient medieval-rinascimental towns built on hill tops, old residence of Signoria dei Malatesta. Trip to Senigallia, a small and nice city near Ancona (Marche), known for the beautiful beach made of soft white sand, 13 kilometers long. The city can be easily reached by train from Ancona or Bologna, by car or by airplane. A short but intensive day hiking inside the Frasassi caves, with more sightseeing in the surroundings landscape of nice green mountains. Visit to the sanctuary of Madonna of Frasassi and Valadier temple, hosting the worl'd largest living crib during Christmas season. Trip to Sansepolcro, a small and charming town in Tuscany, near Arezzo, and home of the artist Piero della Francesca. The town has many ancient palaces and many churches in different styles, from Gothic to Roman, and a well preserved city wall enclosing the entire downtown. Travel to Perugia, Umbria, Italy, for an interesting medieval city trip, between beautiful monuments and interesting arts museums. A trip to Perugia is an interesting extension during a vacation in Italy, as the city is surrounded by many other interesting places, like Assisi and Todi. Trip to Todi, in the heart of central Italy, a beautiful very ancient town enclosed into medieval walls and crossed by two further concentric rings of walls, belonging to different expansion stages of the town during thousands of years. Trip to Orvieto in central Italy (Umbria), an ancient city built over a volcanic basement surrounded by a cliff and very rich in art and culture. Visit to the numerous attractions, like the majestic cathedral, the San Patrizio well, and the underground caves digged during the history below the city. Tour of the countryside around Orvieto. Trip to Civita di Bagnoregio, a unique place in Italy, where an old ancient town, currently populated by only 4-8 people, is built over the top of a flattened hill and is connected to the outside world by just a pedestrian bridge. Trip to Terni, in Umbria, Italy, to see Piediluco lake and Marmore falls, currently considered the continental Europe's highest waterfalls, with their height of 162 meters. The trip continues to Carsulae, an ancient roman empire site and to the medieval town of Narni. This web site is copyright protected, please contact the authors before using any part.